AmeriCalc is the Lowest Cost source for the Mutual Fund Tax information you need to prepare tax returns. 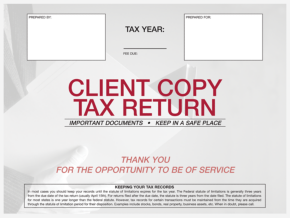 We carry a wide selection of Tax Return Envelopes because we realize the that projecting a professional image is critical to your ability to attract and retain clients. Our line of attractive and durable Tax Envelopes make it easy to store, mail and elegantly present your work to your clients. Presentation is everything! Just a few pennies per return can significantly increase your client's perception of the value of your services. Our presentation materials may be one of the world's best investments. 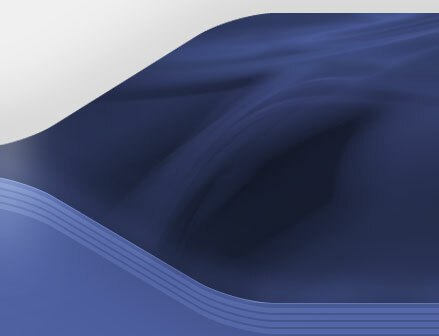 To complete your presentation package, please see our collection of folders and covers. Order Now and TAKE 20% off every product price on this page. Plus, with our low flat rate for S&H, the more you buy, the more you save. 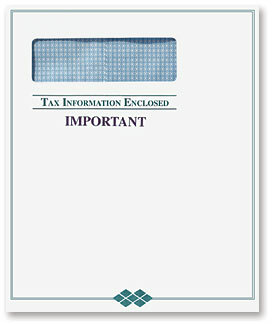 This attractive 10" x 13" envelope with Peel & Close flap is perfect for mailing any tax return or report. It opens on the 13" side for easy of use and, best of all, the speckled paper stock of this envelope perfectly matches the accented ivory folders (numbers 80367, 80368 and 80398). 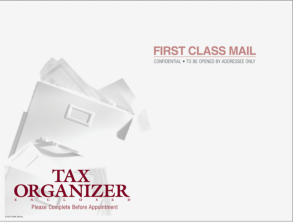 You can be proud to use this 10" x 13" envelope for mailing any tax return or report. But, best of all, the print colors on the white envelopes are designed to coordinate with the vibrant colors of our embossed tax return folders, for the ultimate in professional client presentation. Order Now and Save an extra 20% off every product price on this page! Use this expandable envelope for mailing large tax returns and reports of up to 100 pages. 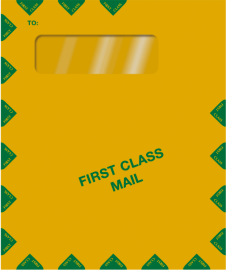 It features a Peel & Close flap for easy mailing. Constructed of durable Tyvek material, this 10 x 12 x 1 envelope is water resistant, tear-resistant and lightweight to help lower your postage costs. 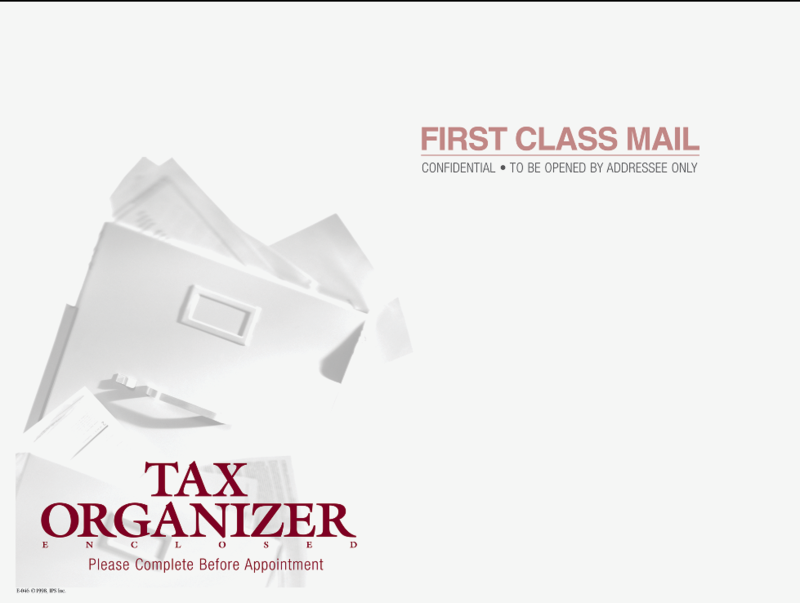 Use this "Income Tax Return" window envelope with available Peel & Close flap to easily mail any tax return. It has a distinctive circle of stars design. 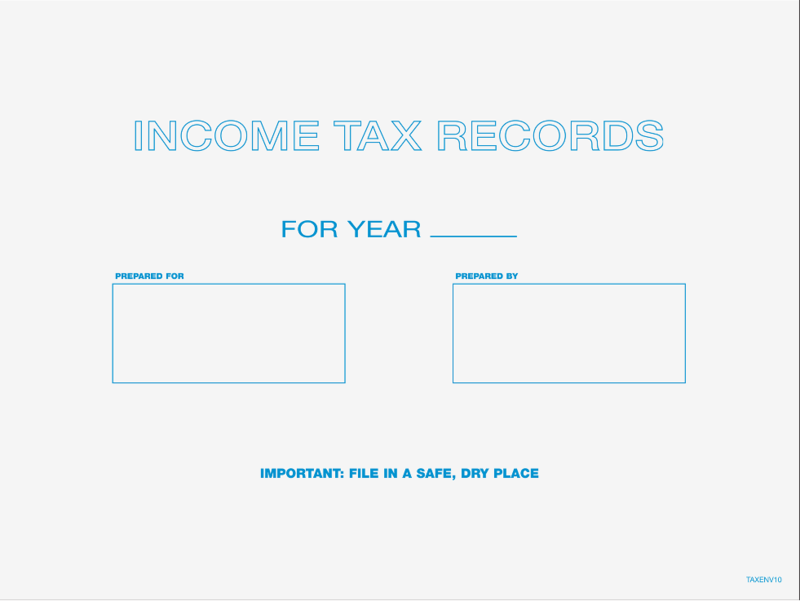 A blue interior tint adds security while the cellophane window allows the taxpayer name and address to clearly show through from the tax return. This 9 1/2" x 11 1/2" envelope is constructed of 28lb paper. The distinctive design of this "Patriotic" window envelope makes it perfect to mail any tax return or report. A blue interior tint adds security while the cellophane window allows the taxpayer name and address to clearly show through. Also available with a Peel & Close flap for added convenience. This 9 1/2" x 11 1/2" envelope is constructed of 28lb paper. Use this envelope with ProSeries, Lacerte, CCH, Drake and all other software. 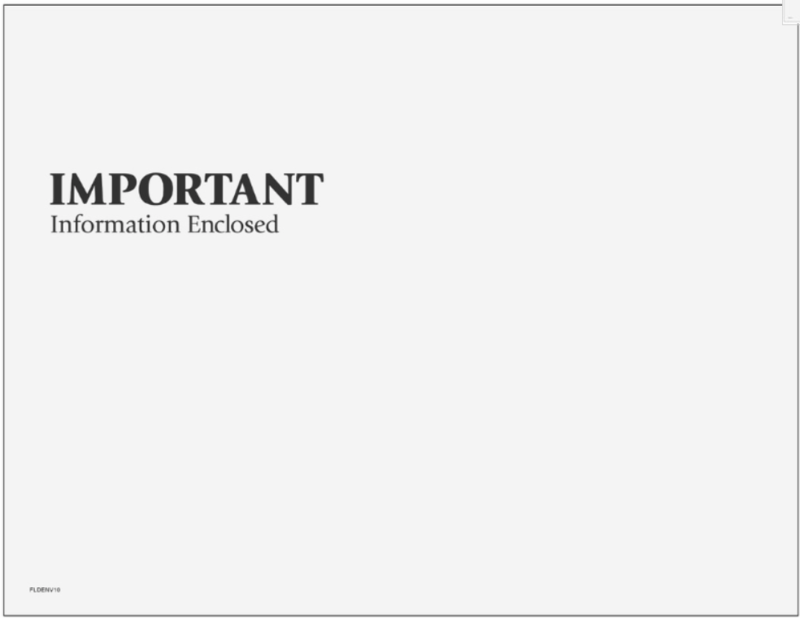 This "Important" window envelope allows you to easily mail any tax return or report. A blue interior tint adds security while the cellophane window allows the taxpayer name and address from the return to clearly show through. Also available with Peel & Close flap. This 9 1/2" x 11 1/2" envelope is constructed of 28lb paper. 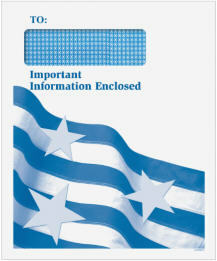 This "Stars & Stripes" window envelope allows you to easily mail any tax return or report. 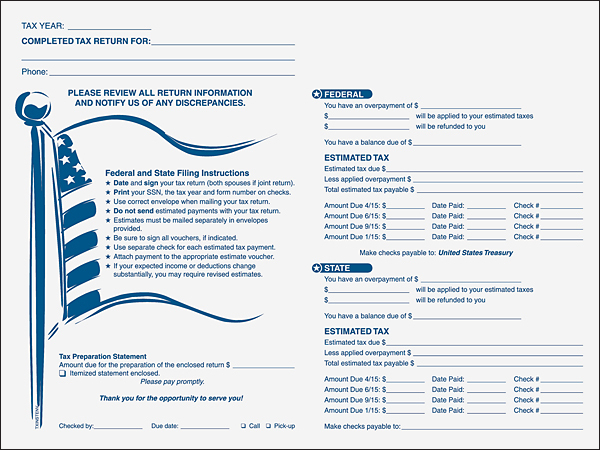 A blue interior tint adds security while the cellophane window allows the taxpayer name and address to clearly show through directly from the tax return. Also available with Peel & Close flap. This 9 1/2" x 11 1/2" envelope is constructed of 28lb paper. The large window on these attention-grabbing envelopes displays the taxpayer's name and address from the 1040, 1040A and 1040EZ. Easily mail any tax return or report. The security tint interior keeps your client's information confidential and the cellophane window displays your client's name and address perfectly. Envelopes are constructed of 28# paper and are 9 1/2" x 11 1/2". 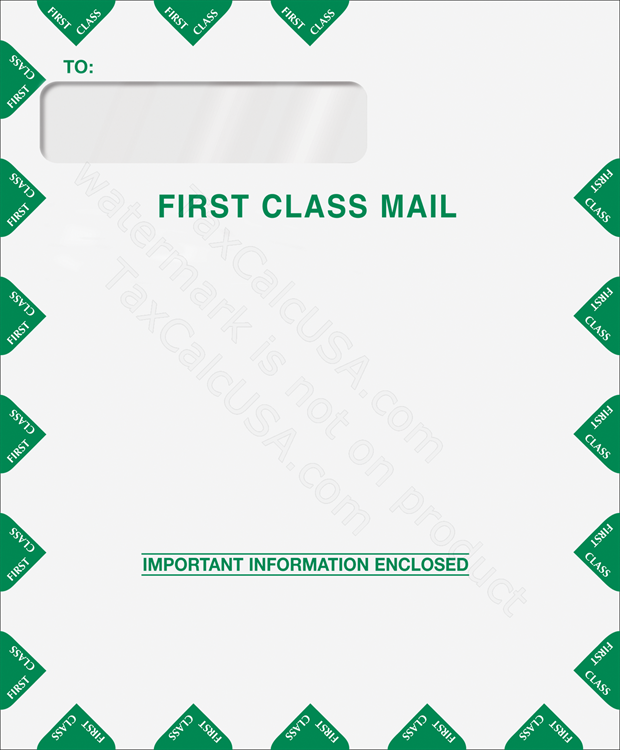 Use this first class mailing envelope for any tax return or other Important Document up to 1/2" thick. Window Size: 1 1/4" x 5"
Window From Left Side: 5/8"
Use this first class mailing envelope for any tax return up to 1/2" thick. Window Size: 1 3/4" x 5 1/2"
Window From Left Side: 1 3/8"
Window From Bottom: 8 9/16"
This First Class mailing envelope is ideal for mailing returns that are thicker than 1/2". 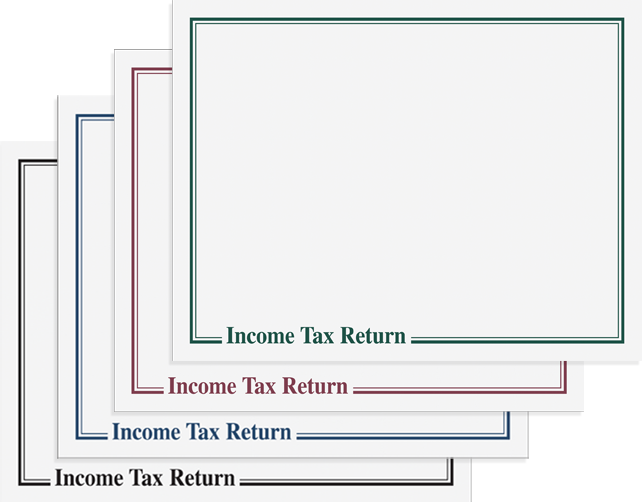 Window From Left Side: 1 1/2"
Window From Bottom: 8 11/16"
This 9-1/2" x 12-5/8" landscape envelope is a great way to deliver tax organizers to your clients. The attention grabbing design will virtually jump out of the mailbox at them. Use as is or have them personalized with your return address for easy mailing. Features 28# white wove stock and a moisture seal flap that opens on the long edge. This 9-1/2" x 12-5/8" landscape envelope has a sophisticated to design to help you present tax returns to your clients in a professional and convenient manor. It features 28# white wove stock and a moisture seal flap that opens on the long edge. Use this 9" x 12" landscape envelope to present clients with an at-a-glance summary of their Federal and State results and instructions on completing the return process. Opens on the long edge and seals with a moisture seal flap. 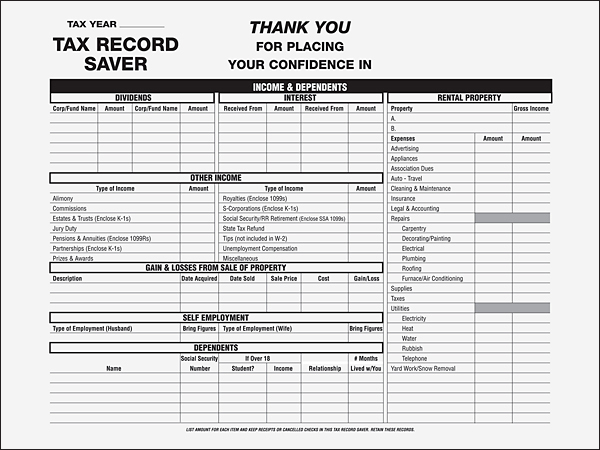 Use this 9" x 12" tax return "saver" envelope to present clients with a summary of their results on the front and back. 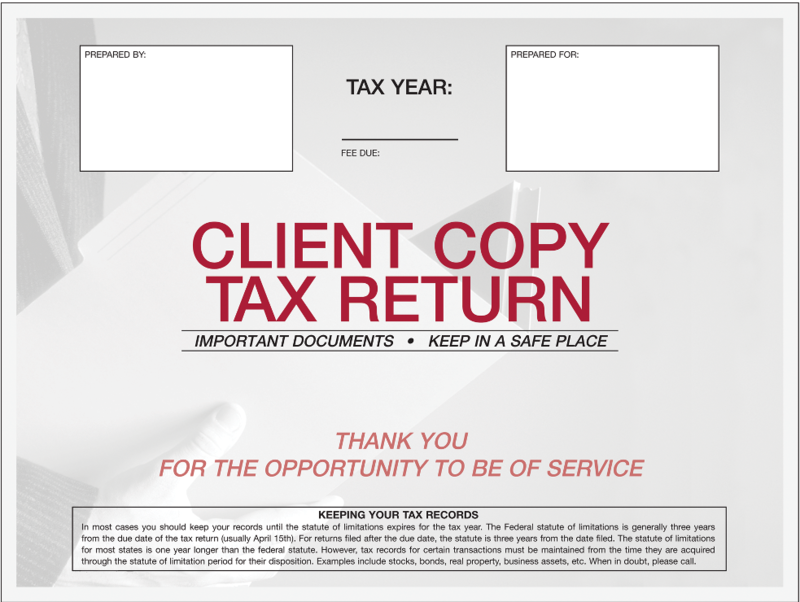 Use this 9" x 12" tax return "processing" envelope to store your client's documents and track every step of the preparation process. 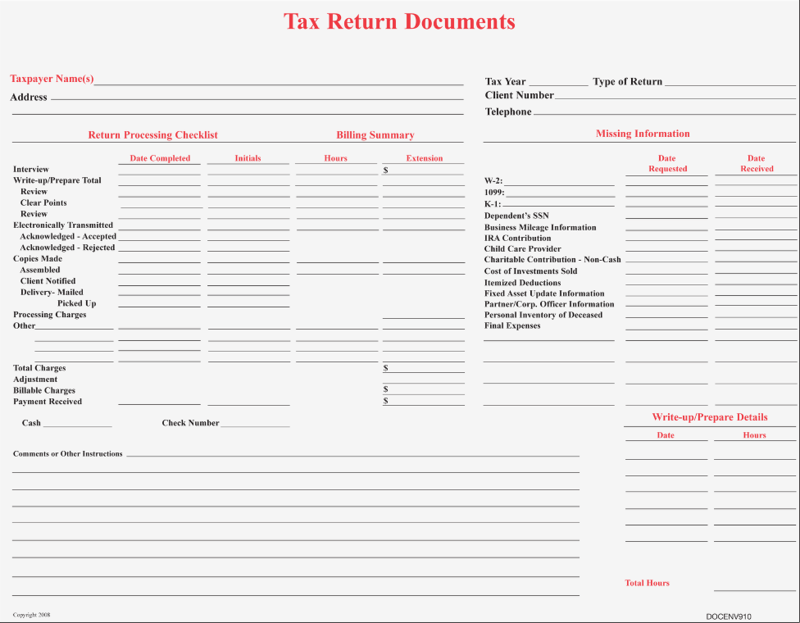 It then provides a convenient way for your client to file and store their finalized return.